Upon his arrival at Highfield Road in November 1990, player-manager Terry Butcher made a number of unpopular decisions with the FA Cup era squad. 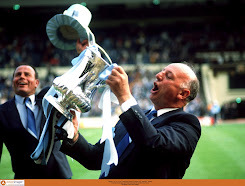 During his 15-month tenure he saw fit to sideline Big Cyrille, Trevor Peake, Brian Kilcline and David Speedie as he looked to stamp his influence on team selection. The man signed to replace the cup-winning captain arrived for just £15,000 from non-league Halesowen Town in March 1991, entering league football at the relatively late age of 24. 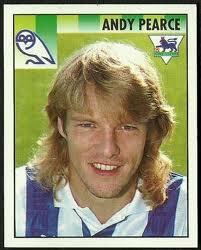 His name was Andy Pearce and he would score the winning goal on his home debut in front of the West Terrace. On that March 1991 night at Highfield Road, Pearce rose above Iain Dowie with seven minutes remaining to seal a 2-1 victory as you can see from the clip below (forward to 3:35 mins). 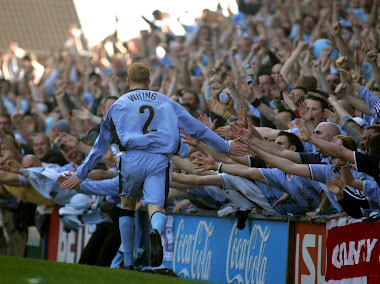 He achieved what all City supporters could only dream of, scoring the winner at Highfield Road the first time you've ever played there and celebrating in front of the West End. 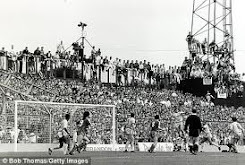 All four of his City goals came at the great stadium with his final strike, in the inaugrual Premier League season, a 2-2 draw with Crystal Palace whose defence comprised messrs Shaw and Coleman. 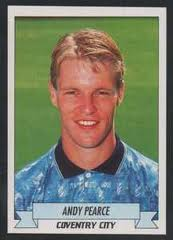 Pearce made 81 appearances for City as he partnered Trevor Peake and Peter Atherton before the arrival of David Busst in early 1993. 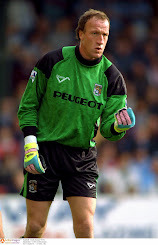 The popular Busst's arrival from non-league Moor Green signalled the end of Pearce's time at City, one of his final games brought that calamitous own goal at Loftus Road when a clearance spun off his right boot to leave’Oggy’ helpless and City on the way to defeat. Sheffield Wednesday signed him for £500,000 where he stayed for two seasons before his career ground to a halt during four seasons at Wimbledon where he made less than a dozen starts, departing in 1999. 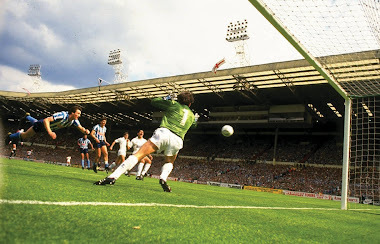 At Hillsborough he achieved cult status with a derby day goal against the Blades while his last career appearance at Highfield Road came in a ‘Crazy Gang’ shirt back in 1995. 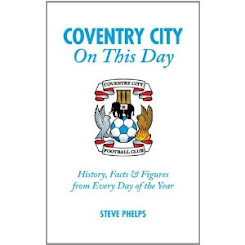 Not renowned for comebacks, nine-man City fought back from 3-1 down to level at 3-3 as Pearce partnered Andy Thorn in their central defence while Richard Shaw saw red for City along with Paul Williams. Last season it took three months to score eight goals. On Saturday, albeit against Hinckley United, City found the net eight times without reply. The arrival of Frenchmen Kevin Malaga and William Edjenguele are the fourth and fifth signings of the close season, strengthening the defence as Richard Keogh's time at the Ricoh seems to be drawing to a close. In recent seasons only Mo Konjic can compare to Keogh's cult-like status, his efforts in sky blue always appreciated by the supporters following his signing from Carlisle United. His stock has risen and he'll always be welcome back at the club and guaranteed a warm reception. 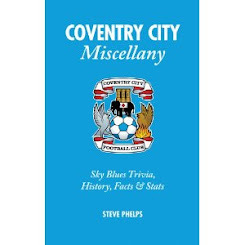 It was expected he would depart (even though he officially hasn't yet) as most decent players do at Coventry yet you just clung onto the hope that he might just be the exception. Andy Thorn has kept his cards close to his chest so far having learnt his lesson from the Marlon King affair. He may well have a few more aces up his sleeve, hopefully a number nine to complement McDonald and Elliott, with a 20 goal marksman a must.